Biologists, breeders and trainers, and champion sled dog racers, Raymond and Lorna Coppinger have more than four decades of experience with literally thousands of dogs. 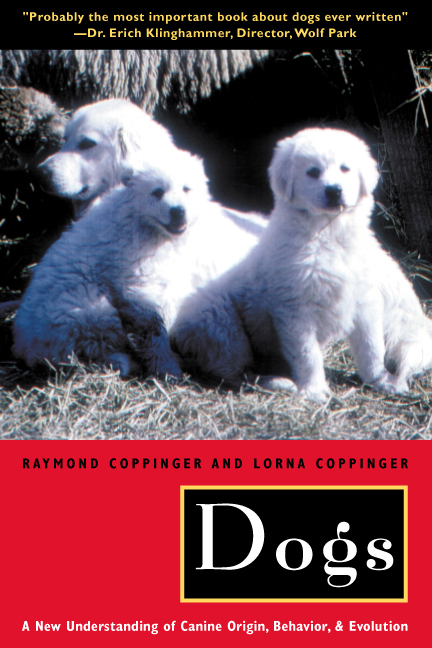 Offering a scientifically informed perspective on canines and their relations with humans, the Coppingers take a close look at eight different types of dogs—household, village, livestock guarding, herding, sled-pulling, pointing, retrieving, and hound. They argue that dogs did not evolve directly from wolves, nor were they trained by early humans; instead they domesticated themselves to exploit a new ecological niche: Mesolithic village dumps. Tracing the evolution of today’s breeds from these village dogs, the Coppingers show how characteristic shapes and behaviors—from pointing and baying to the sleek shapes of running dogs—arise from both genetic heritage and the environments in which pups are raised. For both dogs and humans to get the most out of each other, we need to understand and adapt to the biological needs and dispositions of our canine companions, just as they have to ours. Chapter 9. What’s in the Name Canis familiaris?